Rear leaf spring front cup mounting J-nut clip and boltt. Rear leaf spring front cup mounting J-nut clip. 2 piece kit. Upper control arm bumper, two required per car. 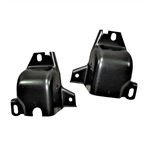 Rear multi leaf spring mounting pad. .
Lower front control arm bushing. 2 required per vehicle. Lower control arm bumper, two required per car. Upper control arm bushing. 4 required per vehicle. Lower rear control arm bushing. 2 required per vehicle. Rear leaf spring front cup mounting hardware J-nut clip and bolt set. One kit does one side. Reproductions of the original rear shock mount reinforcement plates for all 1967-69 Camaro and Firebird models. This EDP coated, die stamped, heavy steel plate mounts to the trunk floor and has two threaded holes. Reproduction of the original boot for 1967-69 Camaro and Firebird models that slides over the steering column at the base of the floor. Replacing your boot will help keep fluids from entering through the firewall area. This high quality reproduction is licensed as official GM Restoration parts. Note: Installation requires removal of the steering column from the vehicle. Rear leaf spring shackle kit. Does one leaf spring. Reproduction steering coupling joint for 1967-69 Camaro models with power steering and used on other various 1959-79 GM models . Reproduction steering coupling joint for 1967-69 Camaro models with manual steering and used on other various 1959-82 GM models . Pin Diameter: 5/16" & 3/8"
Technically correct OE quality bushings with identical appearance to factory originals. Includes 8 bushings which does both sides. Upper and lower tubular arm kit. 3) The bushings also have machined bevel, stainless washers, and stainless lock nuts. 4) The suspension geometry is improved over stock by increasing camber gain and improving roll camber. 5) The tubular lower control arms replace stock lower control arms. 6) The upper control arms also feature powder coated gloss black machined tube ends for precision fits which are assembled with ball joints. 7) These new tubular lower control arms features a robust tubular design with gussets and cross brace, bushings with steel housings and crush tubes, and a powder coated gloss black finish. 8) The upper control arms also utilize grease able bushings which make for increased stiffness over stock to provide more consistent and precise handling. Reproduction of the complete subframe for all 1967 Camaro and Firebird models. Manufactured in OE-spec heavy gauge steel as original, these subframes have been carefully reproduced with all correct welds, mounting holes and brackets for a totally OEM appearance. In addition, these subframes have also been internally reinforced in the lower crossmember to add strength while maintaining an as-factory appearance. Reproduction of the complete subframe for all 1968 Camaro and Firebird models. Manufactured in OE-spec heavy gauge steel as original, these subframes have been carefully reproduced with all correct welds, mounting holes and brackets for a totally OEM appearance. In addition, these subframes have also been internally reinforced in the lower crossmember to add strength while maintaining an as-factory appearance. Reproduction of the complete subframe for all 1969 Camaro and Firebird models. Manufactured in OE-spec heavy gauge steel as original, these subframes have been carefully reproduced with all correct welds, mounting holes and brackets for a totally OEM appearance. In addition, these subframes have also been internally reinforced in the lower crossmember to add strength while maintaining an as-factory appearance.